About six weeks after the loss of Nora (at 40 weeks and 4 days pregnant to stillbirth) I was sitting in my therapist's office for couple's therapy with my husband. My therapist, Amber, asked me, "So, what have you decided about the nursery?" The nursery is right next to our bedroom and I walk by her room everyday, sometimes 10 times a day. So, I had been thinking about this since the day we went home from the hospital without our sweet, baby girl. In that moment that Amber asked the question, I was brought back to the days right after Nora's death and the feelings of overwheleming dread and sadness that came after coming home from the hospital and walking by her room for the first time. I kept the door to her room closed. Actually, I remember vividly, leaving for the hospital at 2 a.m. on that Sunday morning and walking by her room to go down stairs to get in the car where my husband was eagerly hearding me, and I subconciously closed the door to the nursery before we left. I wonder, if a part of me knew then that I wasn't coming home with a baby. So, in the days after the funeral, and when everyone finally left after that first chatotic week of grief, I opened her room back up. I started with just a crack. As if she were actually in her crib sleeping, and I didn't want any noise from the rest of the house to wake her up, but I couldn't bear to close the door all the way out of a mothers' need to be close, watchful. Then, each day I would open the door slightly more, and as I walked by twinges of pain would surge through my body as I saw her empty carseat, sitting there, staring at me, the object taking on it's own huministic form and talking to me, asking where the baby was and why her, the car seat, had to come home without her. My heart wept for the car seat but I know I was weeping for my baby girl. The entangled and conflictual realtionship with the nursery continued as the weeks went on. Two weeks after her death, I couldn't handle my overwheleming loss and pain one night while laying next to my husband in bed. Tears started silently rolling down my cheeks and I sprang out of bed, and ran towards the only place I had left of her. 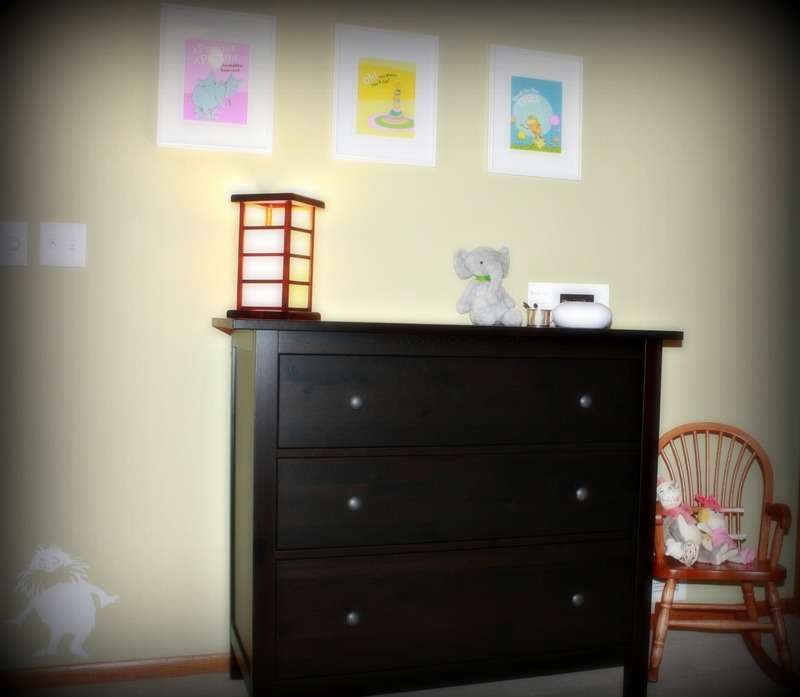 I threw myself down on the floor in the middle of the nursery and cried loudly with sobs and enough tears that my husband and I would have to build a boat in her nursery to keep us afloat through the pain. Nick, my husband, came into the nursery after me along with George, our little dog, and we all wept together on the floor. My husband trying to comfort me, or trying to find comfort for his sorrow through holding me. While my little G-man (George), not able to bear the pain of watching or hearing mom sob any longer, began to howl and cry for his lost human sister, that he also never got the chance to know. In that moment, all three of us used the nursery to connect to the family member that was so wanted, but so missed. Now, two and half months later I go into her room. I call it her room. I sometimes sit in the rocking chair my parents gave me, that my mother got as a gift from my father when I was born, and look out the window and envision what it would have been like to hold and rock Nora there. I sometimes go through her clothes that were so nicely put away and are still there, waiting with aniticipation to be worn. This is the hardest part for me, looking at the clothes that I bought with loving anticipation that she one day would wear; sadness floods me as I realize this will never be. She is in her room for now. She sits atop her dresser in an urn with a teddy bear on it, waiting for the day when Nick and I have the courage to release her ashes into the world and once again say goodbye, in another way, at another time. I already have plans for her room for the future. Nick and I have talked about changing it in design or getting rid of her clothes. But Nora was going to have a little brother or sister some day, and with how frugal my husband is, Nora was going to have to pass down her clothes and share her room with her yet to be sibling. 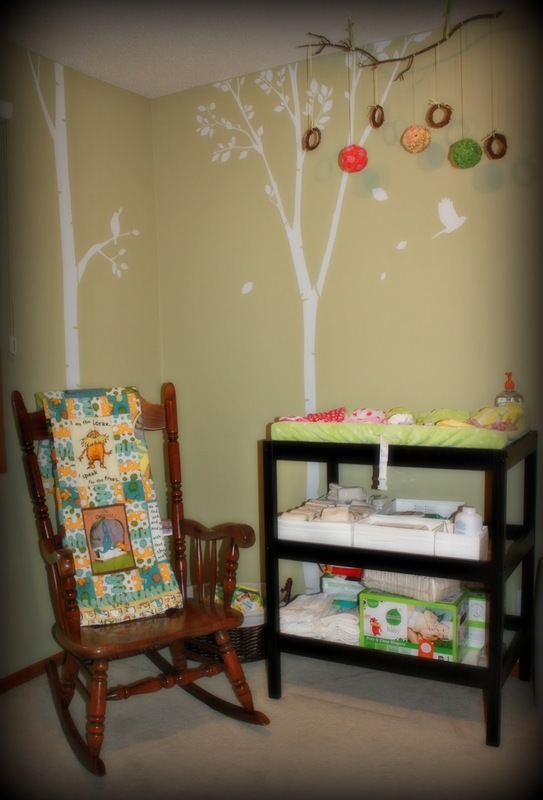 So, we hold onto her nursery for now. Eagerly waiting for the day that it can be used, instead of reused, by her future brother or sister. When answering my therapists question about, "Have you decided what you are going to do with the nursery?" I finally answered in that moment, "I think I will be more ready to attend to it, to change it, to reinvent it, when we get pregnant again." Amber said that this answer made sense, and she also validated that it's good that we haven't made any rash decisions about it yet. My husband shared with me, that at times he goes into her room and talks to her. He stops by and chats with her while I'm downstairs in the living room or away at work. He uses the room to spend time with her still and grieve for our child that will never be. I'm not ready to take that away from him yet. I'm not ready to take that away from me yet. 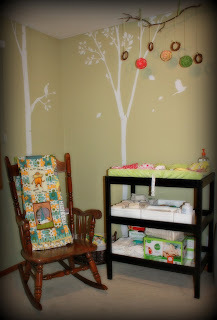 By the end of the year, no matter if we are pregnant or not, I plan on 'changing' her room in some way or another, depending on our situation at the time. I will take time out to spend time with Nora again, by packing up parts of her, memories we have through her possessions, storing them away in a memory box for us to share with our future children. This will be a time, where I once again slowly and repeatedly say goodbye to my daughter in a new way, in hopes to close a chapter and start a new beginning. Hi Lindsey. I finally worked up the courage to come and read your writing. Pretty weak considering I'm not the one with the traumatic life experience at hand, but still so very very sad and difficult to process. I was so sorry to hear about this, and became quite emotional again while reading through all your posts. I'm glad you and your husband are (slowly) finding helpful ways of grieving. Here's to things looking up as 2013 progresses. Thank you Emma for your kind words. I hope all is going well in Maine, I love your pics on Facebook. Lindsey, you remind me so much of myself with your nursery post. 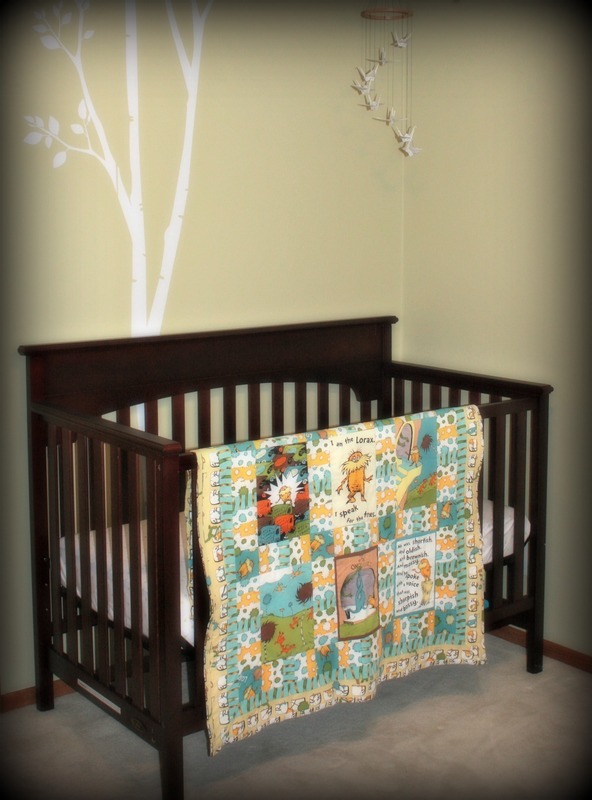 The only way I was able to take mine down was when we moved a few months after our full term son was stillborn. Stop by at www.fittsie'sangels.blogspot.com or just google fittsie's angels. I'm reading your blog from the beginning. We lost our Patrick three weeks ago, and I find what you've written resonates with me so much. We don't have space in our apartment for a whole nursery right now, so we hadn't set up everything yet. But, the things I already had out, I can't put away. And I've commandeered Patrick's quilt for myself. I can't sleep without it. I'd made it when he was only a wish in our minds. I recognize that Dr. Seuss fabric, so I know someone lovingly made that quilt for Nora. Love to you all. I don't wish this on my worst enemy.